In 1999, I had no idea I was about to start a life-long career in education. Having just left the Chicago Symphony Orchestra where I worked to raise funds from donors, I was really unsure of what to do with my life. While the CSO was interesting, I knew that I hated phone work making the call from Americorps inviting me to become a volunteer an offer that was hard to refuse. There are many ways a person can serve their country, some go into military services, other do public work, many head towards the Peacecorps, but I chose Americorps. As an Americorps volunteer I completed 2000 hours of volunteer service in the west side of Chicago working to develop arts and music programming at five different schools with a home base located at the Northwestern University Settlement House. Being a volunteer in education made it clear to me that education was what I most wanted to do. Perhaps, most of all, because what I did with learners in Chicago for the two years I volunteered was as creative and innovative as possible. I worked with students from low income background, students with little to no English ability, immigrant parents trying to settle in America coming from a variety of situations. There were so many creative projects: teaching metamorphosis by helping a class of 2nd graders raise mill worms, teaching geometry and mathematics by having 9th graders build polyhedrons with cardboard and rubber-bands, and teaching global community and culture by teaching 6 year olds how to make costumes and props representing a number of countries. I loved the challenge of creating interesting content and activities that were also meaningful and inspiring to learners. I took this love of creativity with me into language education where I have continued to develop unique learning activities designed to support language growth: using graphic organizers to help learners process readings (about weird and unusual animals) to understand or world,using youtube videos for writing prompts, or using lateral thinking techniques to encourage creative communication. If it can be done, I’ve tried. Creativity and innovation keep good teachers motivated and help prevent fatigue and burnout. During my career I’ve met thousands of other engaged and unique teachers with brilliant ideas for encouraging amazing growth in their classrooms. And now, there is a chance for those teachers to be recognize for their contributions. 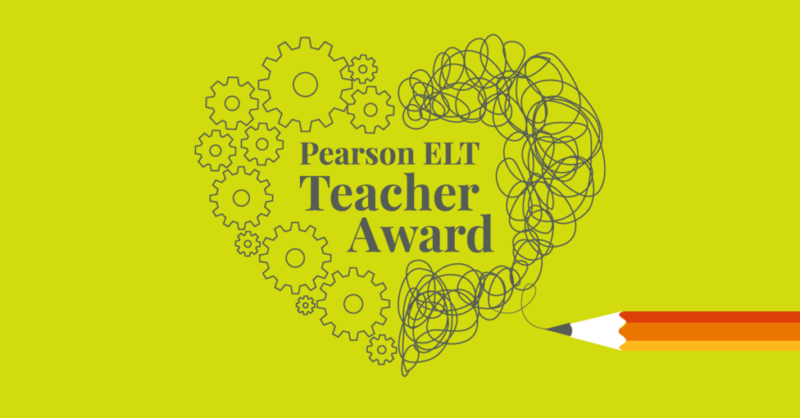 This week, Pearson English launched the Pearson ELT Teacher Award. The award is open to English teachers everywhere in the world. It’s free to enter your application and, those who are identified leaders of innovation in ELT will have an opportunity to attend TESOL 2017 or IATEFL 2017 for free! As a note, one of the esteemed judges is none other than David Nunan. I know so many great teachers out there, so I hope you will take a moment to apply and then share this application with your peers and colleagues. I’ll be at TESOL 2017 and I hope to see you there. This entry was written by saradavila, posted on October 6, 2016 at 1:58 pm, filed under News, Teacher Tools. Bookmark the permalink. Follow any comments here with the RSS feed for this post. Comments are closed, but you can leave a trackback: Trackback URL.